Does your business have multiple vehicles on the road? If so, you may be concerned about the whereabouts of your delivery drivers or field service persons and whether or not they are using your vehicles for private jobs? With GPS vehicle trackers you will be able to track the route and usage of each vehicle you own and know whether they were being used inappropriately. GPS vehicle trackers are an easy device to install and will provide detailed usage reports on your vehicles from the convenience of any computer, tablet or mobile device. Customer site – how much time was spent in total at customer sites (regular customer sites). Driving time – how much of the day was spent actually moving (driving) in hours and minutes. Example below. 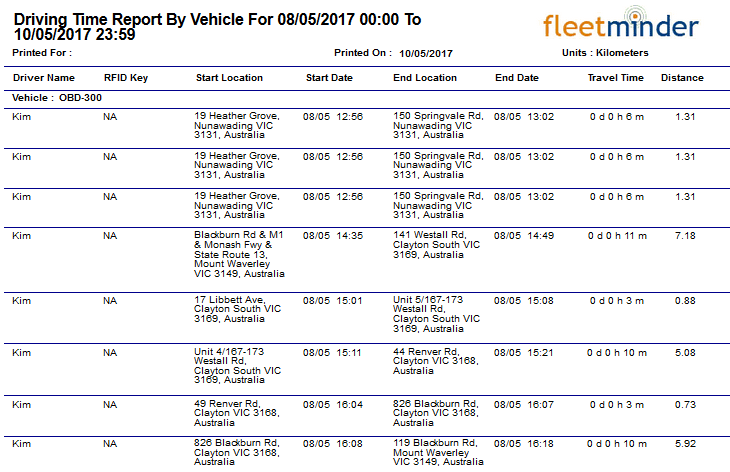 These reports are very useful to a fleet operator to determine how productive each vehicle and driver is. By tracking the locations that vehicle has traveled you will be able to assess if the vehicle was used inappropriately and take the necessary steps to protect your vehicle and stop misuse. And just the fact of informing drivers that GPS vehicle trackers are installed and proving it by showing them the reports makes them think twice about misusing the vehicle or their time out on the road. A second feature that will help to stop vehicle misuse is the geofencing capabilities available on GPS vehicle trackers. Geofencing technology allows the user to create a virtual perimeter and if the vehicle leaves that perimeter then a notification will be sent to the owner allowing them to take action. This is useful if you would like to create an operating area to a part of your city (or the whole city) and being alerted if your drivers make any long trips or private country trips. 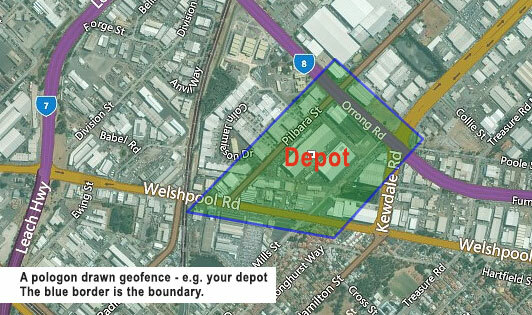 Or you can set a geofence for your depot and be notified when the vehicle leaves the depot (as below). The geofencing function provided by fleetminder can be set using either the FREE mobile phone app or by using the fleetminder Live Tracking system (see pictures below). Protecting vehicle assets has never been as easy as it is when using GPS vehicle trackers and taking advantage of the automated usage report and geofencing features available with this state of the art technology.